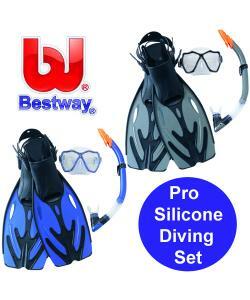 This Pro diving set is full of features to make diving in the pool or sea comfortable. The mask features a silicone skirt and tempered glass lense. Ortho-engineered, silicone snorkel mouthpiece makes breathing easy and the Dry Top valve prevents virtually all water infiltration. Soft comfort-tested fins size Mens 7-10 with adjustable heel strap. New "Drive Zone" center with special Power Flex ribbing. Silicone skirt with double feathered edge for a precision, leak resistant fit. Soft comfort-tested fins size Mens 7-10 with adjustable heel strap.